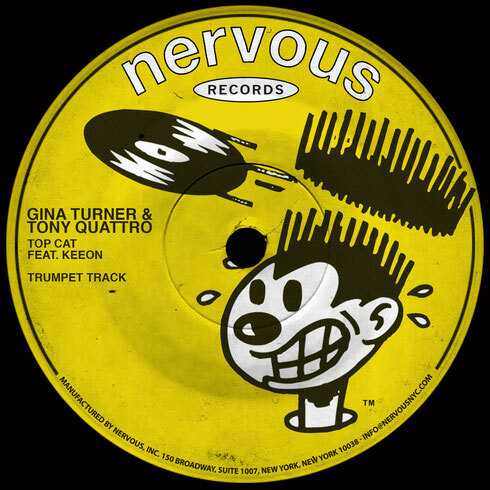 Gina Turner and Tony Quattro team up with Keeon for a trio of brass-focused cuts on one of New York’s longest standing house labels, Nervous NYC. Cutting her teeth in Boston’s scene, Gina then moved to LA where she’s since worked with Soulwax, Diplo, Steve Lawler and Tiefschwarz, as well as forming duos such as Staccato, with Louisahhh, and Nouveau Yorican, with Laidback Luke. Collaborating with her on this occasion is Tony Quattro, a NYC native known for a medley of releases on Trouble & Bass and Main Course, plus much support from Radio 1 and Rinse FM, as well as artists such as Rudimental, Stanton Warriors and Crookers. ‘Top Cat’ sees Gina and Tony collaborate with Keeon, pairing a pervasive low-end with intermittent trumpet riffs to accompany raw drums and sultry vocal murmurs. The Dub then filters out the bass whilst shifting the focus to crunchy percussion for a punchier dancefloor feel, before ‘That Trumpet Track’ is driven by filtered toms, high pitch trumpet melodies and sporadic vocal echoes that together make for a nice summer-fueled finish.